It took over a year of negotiations, but Dark Night of the Soul was finally officially released on July 13, 2010 by EMI. Dark Night Of The Soul, features Danger Mouse and Sparklehorse joined by a remarkable roll call of guests including David Lynch, the Flaming Lips, Gruff Rhys, Jason Lytle, Julian Casablancas, Black Francis, Iggy Pop, James Mercer, Nina Persson, Suzanne Vega and the late Vic Chesnutt, in whose memory the record is also dedicated. Rumors of this mysterious collaborative project began to circulate in early 2009 sparking widespread anticipation and excitement. However, while DNOTS successfully manifested itself as both a limited edition art book with enclosed blank CD-R and an audio-visual gallery installation, July’s worldwide release via EMI marked the first time this music has officially been made available. Danger Mouse adds: “I told Mark that we’d worked things out with EMI back in January and he was very happy that the album was finally going to be released this year. Mark meant a great deal to a lot of people and I’m grateful to have made music with him and to be a part of his legacy.”In addition to featuring on two songs, David Lynch has created a series of original photographs for Dark Night Of The Soul adding a spectacular visual dimension that will be incorporated in to the artwork for this already unparalleled project. 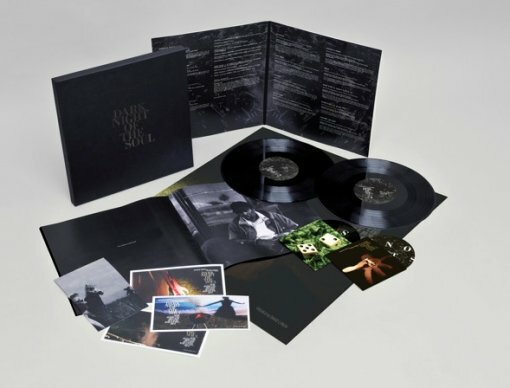 If you’d like to win the sweet deluxe vinyl edition of Dark Night of the Soul pictured above, then fill out the contest entry form after the jump. Contest ends on Sunday, August 15, 1 entry per household, US residents only.